In this comprehensive volume, you will find information about Vietnamese, Cantonese, Mandarin, Japanese, Khmer, Korean, Samoan, Hmong, Laotian, and other languages. 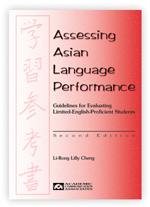 The book also presents important information about cultural differences in the pragmatic uses of language and how these differences affect performance at school. Articulation and language differences between English and other languages are described. This book will be helpful in identifying individuals with speech and language disorders who come from Asian language backgrounds. Both the structural and pragmatic aspects of communication are covered in this comprehensive resource.